Sometimes homages can be too reverential. 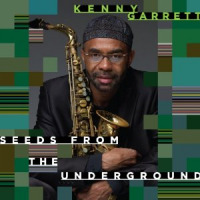 Alto saxophonist Kenny Garrett, with a spiritual energy mirroring a significant influence, John Coltrane, intended to use Beyond the Wall as an opportunity to record with pianist McCoy Tyner, with whom he's shared the bandstand on occasion. Though a scheduling conflict prevented Tyner from participating, his spiritand that of his late employerlooms large over the project. The result echoes the scope of larger-scale Tyner projects like Asante (Blue Note, 1970) and the fierce modality of middle-period Coltrane. With Tyner unavailable, Garrett's choice of Mulgrew Miller was inevitable. With so many pianists citing Bill Evans as a primary influence, Miller has defined his career by looking to Tyner for his primary inspiration. Garrett had already tailored his writing on Beyond the Wall to Tyner's distinctive language, so Miller gets to pay tribute but, with a more muscular sound, still speak with his own voice. And direct links are forged on most of the disc, to both Tyner and Coltrane, with the appearances of tenor saxophonist Pharoah Sanders and vibraphonist Bobby Hutcherson. Beyond the Wall came about because of a 2005 visit to mainland China, inspired by Garrett's longstanding interest in the nation's culture and spirituality. He's always been a deeply passionate player who can speak volumes with a single note, and the relentless intensity of the majority of this record makes it the most purely cathartic album he's ever recorded. Whether it's the out-of-time opening to "Calling," which resolves into a slow 6/8 vamp where Sanders and Garrett solo in tandem, or the up-tempo burn of the title track, everyone is firing on all cylinders. And while the route through Tyner must inherently lead back to Coltrane, Garrett's headsmore fully-realized than Coltrane's relatively short themesecho Tyner's more compositional approach to setting context for improvisation. There is some respite, specifically "Realization: Marching Towards the Light)," where a sampled chorus is the pulse that drives the song, and the chamber-like "Tsunami Song," featuring Garrett on piano and a haunting melody played by Guowei Wang on the bowed, two-stringed erhu. From there it's a gradual buildup from the light funk of "Kiss to the Skies" to the finale, "May Peace Be Upon Them." "Kiss" is one of four songs to feature wordless vocals and, while they're interesting the first few times around, they ultimately feel superfluous. "May Peace" is curiously ambiguous, beginning in a gentle space but leading to an out-of-time whirlpool of sound featuring Garrett at his most visceral. It's hard to find fault with the deeply emotional ride of Beyond the Wall except, perhaps, in its unrelenting seriousness. Still, with a cast of players this strong, one can forgive its earnestness and revel in performances that bring Tyner's and Coltrane's innovations into the 21st Century. Track Listing: Calling; Beyond the Wall; Qing Wen; Realization (Marching Toward the Light); Tsunami Song; Kiss to the Skies; Now; Gwoka; May Peace Be Upon Them. 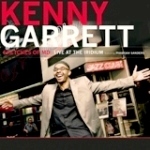 Personnel: Kenny Garrett: alto saxophone (1-4,6-9), piano (5); Pharaoh Sanders: tenor saxophone (1-4,6-8); Mulgrew Miller (1-4,6-9); Robert Hurst, III: bass; Brian Blade: drums; Bobby Hutcherson: vibes (3,4,6,7,8); Ruggerio Boccato: percussion (1,3,4-8); Nedelka Echols: vocals (3,4,6,8); Genea Martin, Kevin Wheatley, Arlene Lewis, Geovanti Steward, Dawn Caveness: vocals (6,8): vocals; Guowei Wang: erhu (5); Jonathan Gandelsman: violin (5); Neil Humphrey: cello (5); Susan Jolles: harp (5).